I don't usually talk about my own work on here, but this is something I am particularly proud of: after months of hard work and preparation, working with a team that spanned from San Francisco to Milan, it's here: the KIT Social Program Guide or SPG. What Is An SPG? It's a Social Program Guide- a white label product that lays social functionality on top of a pay-TV provider's EPG so that viewers can see what their friends are up to and then act on that information... by actually changing the channel or hitting "Record." Hence "social" program guide. We're emphasizing the program guide end of things because the genesis of this product is our belief that people rely heaviest on social data in the discovery phase - when they are figuring out what to watch. The KIT SPG lets them get input from a number of sources: friends, neighbors, all viewers, and critics. Chat-- via Twitter, Facebook and other social networks, is enabled, but we have found that chat usage varies greatly depending on the type of show. 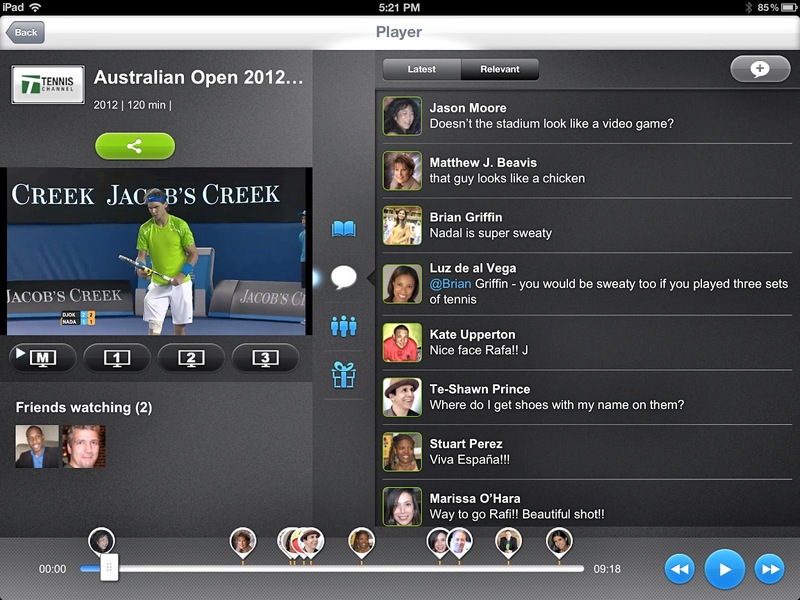 That, and the presence of multiple chat options, makes this a secondary feature. An important one, but secondary nonetheless. A Social Program Guide also offers advertisers a real opportunity because they are now able to sync their first and second screen ads. 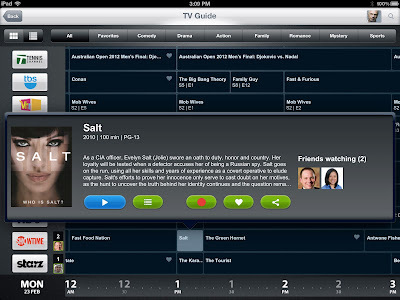 That means a viewer will see a TV commercial during the show while a more detailed and personalized ad is shown on the second screen. We don't think viewers will interrupt their viewing experience to buy things during the show, but they will tap a button to see more information once the show is over. INDIVIDUAL ACCOUNTS: Every family member gets their own account which is tied to their social networks. That means everyone can be sharing a first screen experience while simultaneously having a personalized second screen experience. WATCHLIST: Your go-to screen, it combines all the shows you've recorded, added to the watch list or bookmarked via the (pay) On Demand service. 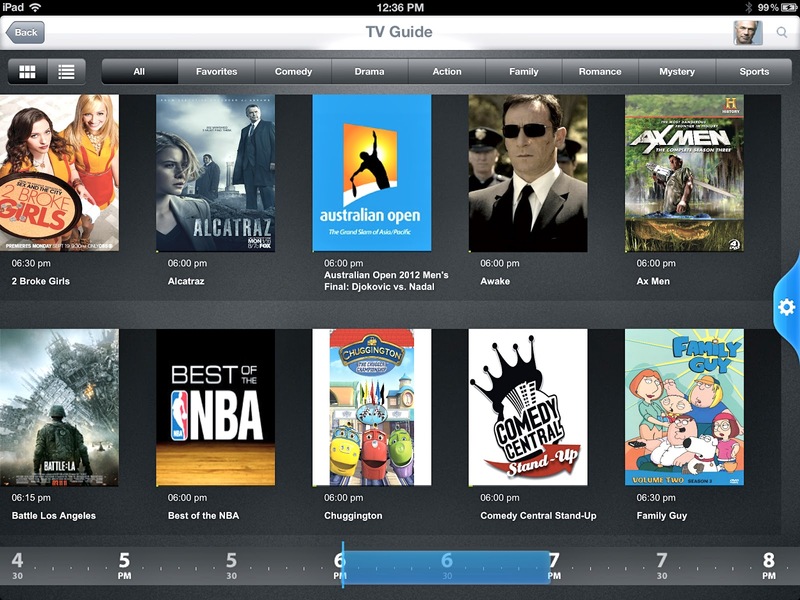 TV GUIDE: Two views: a traditional Grid EPG that highlights which shows your friends are watching, and a Recommended Viewing matrix that sorts what's currently on air via an algorithm that combines your preferences with recommendations and activity from your social graph and/or critics. ASYNCHRONOUS COMMENTING: If you are watching something after it's aired, your friends comments are saved in a timeline and shown in real time, so you the experience is not ruined by spoilers. The Recommended tab on the TV Guide uses a unique social algorithm to rank the shows currently on air for you, so you don't waste time searching through 2,000 channels. So your friends don't give away the ending: comments are embedded in the video and show up at the appropriate time. You can see which of your friends are watching from the TV Guide's grid view. This makes picking out what to watch a lot easier-- and more social.